We saw it was time to seize the moment as an enormous transition in retail was underway -The Information Age! The model was developing proprietary technologies amassing one of the largest direct from cutter diamond supply networks in the world – along with leveraging advancements for high level physical evaluation of diamonds that go way beyond the human eye. A New Age experience offering customers better education better options and better than online pricing - a hybrid of sorts between Internet and brick and click. With 30 years experience in the industry and a background in IT a transformed Mavilo is unveiled. No additional stores needed, no traditional advertising, one corporate location one online platform now sells on average more than 30 traditional retail stores and growing. 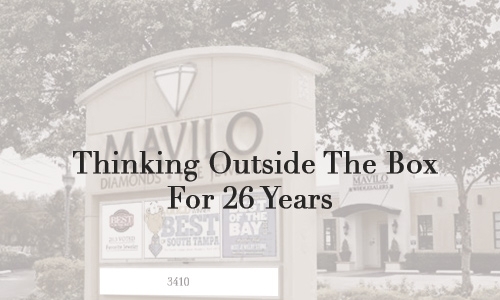 In addition to our flagship location and online platform, Mavilo maintains a thriving wholesale business supplying diamonds, gemstones and finished jewelry to the industry. We have collaborated with a variety of networks and retailers over the years where exclusive lines are showcased. These long-standing relationships allow us additional leverage in purchasing power and another reason why were able to constantly bring in new exciting inventory and maintain our highly competitive pricing structure. Designing jewelry takes intrinsic passion, an understanding of environment, scale and balance. It also requires a connection to you, the customer – being familiar with the occasions of your life, what influences you and what defines your personal style. Mavilo designs its exclusive collections with all of this in mind, reinventing timeless classics to be handed down for generations, as well as developing on-trend pieces that complement current fashion trends and enhance individual style. We've spent many years really getting to know our customers, and invest significant resources in design talent, sourcing, and staying ahead of trends – this means we have a lot of confidence that our design aesthetic will inspire and resonate with you. Mavilo has an in-house team with a passion for design and decades of experience working with customers to understand the importance of fit, style and proportion. From our exclusive Oliva and Links Collections to more classic pieces, our aesthetic and attention to detail is comparable to that of the highest-caliber design houses, and you will find our brand laser-inscribed on most pieces as a testament to the quality and prestige associated with the Mavilo name. We also feature a large selection of outside designer collections, from fun, casual, to ultra-refined, European-inspired work. We have our finger on the pulse of design direction and how it influences trends, and get really excited whenever we introduce a new line that we know will resonate with our customers. Design is in our DNA – the only thing we are more passionate about is sharing it with you! Mavilo invests in the latest technology, equipment and skilled talent to ensure that our designers' concepts are produced exactly as envisioned, down to the smallest detail. Complicated techniques such as milgrain, micro pave, micro prong and channel-set are achieved flawlessly, resulting in finely crafted jewelry that is both beautiful and enduring..
We think it's important to employ the best traditional craftsmen AND computer design specialists so that the final product reflects best practices. Technology is only as good as the latest innovation, so we make it a priority to stay on the cutting edge, and also to find ways to integrate new methods and approaches into all aspects of our business. A great example is our use of Computer Aided Design (CAD), which has transformed not only the way we develop our own collections, but how we are able to work with our customers on custom orders and commissioned designs. Our on-staff CAD artist utilizes software that allows us to create 2- and 3-dimensional renderings exactly to your specifications. This means you can preview your custom piece from all angles with incredible precision, on a computer monitor, before our craftsmen picks up a tool! Revisions are incredibly easy to complete, and we can even use our 3D Printer to create an exact replica, to scale, so you have an idea of exactly what the final product will be like. Since we've implemented CAD, CAM (Computer Aided Milling/Manufacturing) and 3D printing technology, our already high satisfaction rate on custom work has jumped to nearly 100%, and volume has increased significantly. Go to our Custom Design Process for more details. Our flagship location, in the heart of South Tampa, was designed to provide the ultimate diamond and jewelry experience. Beautifully appointed yet approachable – a reflection of the quality of the collections we carry – this is not your ordinary shopping destination. We are known for our ability to present amazing jewelry in an elegant environment that encourages interaction at your pace, and on your terms. Whether you have come in to view our selection of loose diamonds, or just want to browse our constantly updated selection of fine jewelry, our welcoming, highly educated staff will be there to guide you. We appreciate that you have come to see us because of a referral from a trusted friend, and we intend to live up to (and most likely surpass!) your highest expectations. We are always thinking of ways for our open, inviting showroom to reflect the latest technology and design sensibility. Our vast array of jewelry is displayed in innovative, inspired ways that make it easy for our guests to browse or focus on a specific area or collection. Showcases are thoughtfully merchandised spaces, designed to be approached and admired from any angle. Many are equipped with iPads, loaded with videos and styling suggestions from our featured designers. We can also accommodate you in our intimate and discreet Private Viewing Room. See our master jewelers at work in the Service Department, using the latest technology and precision equipment. And if you have to step away to take a call or are waiting for a spouse or a purchase to be gift-wrapped, relax in our Lounge equipped with Internet access, a flat screen TV, cappuccino machine, and comfortable seating area. Mavilo maintains one of the largest Loose Diamond inventories in the country, and has technically ( Read More about Our Proprietary Platforms - DiamondFax) selected each of the diamonds in our collection for its exceptional brilliance and value. It's our pleasure to show you a variety of diamonds and explain how they differ in quality and how to determine which diamond is right for you. Another reason why we stand apart is our massive fine jewelry selections. The size of our store, the fact that we own every item we offer, including a wide range of exclusive designs, and our ability to anticipate trends and the kinds of pieces we know our customers will appreciate… all of these factors give us the ability to constantly add new styles and collections, from the classics to the most fashion-forward, at a variety of price points. We are passionate about design, and invest an impressive amount of resources to ensure that what you see in our store is a reflection of what you can usually only discover at progressive retailers in global capitals, online and trend-setting destinations. We travel the world three times a year for inspiration, as well as for sourcing the best new designers and gemstone providers, so that we can surprise and delight our customers with something new every time they come to visit. Our goal is to get to know you, so that each visit with us is spent shopping and learning based on your individual preferences. We create a personal profile for each customer so that we have all of your information compiled and available for quick reference. From your contact information, to your ring sizes, to copies of appraisals for each item you have purchased, to how and when you would like to be contacted… it's all accessible on demand. We also maintain your personal Wish List, which keeps track of each piece you have viewed with a Sales Associate, so you have it on file for future consideration. Upon request, we can also share your Wish List with a significant other as a subtle, helpful hint. Maintained with the utmost discretion, your profile can be accessed whenever you visit, call or email us. Your privacy is our concern, and this information is never sold to or shared with outside companies; it is only used to facilitate service and ensure the accuracy of every transaction and experience with Mavilo. Beyond the technology we have put in place to enhance and streamline your experience, we make it a priority to become familiar with you and your personal style. We proudly honor a tradition of working with families over generations, and cherish the opportunity to help you select meaningful, thoughtful gifts and future heirlooms for the important occasions of your life. You might notice that our showroom often feels like Happy Hour, not only because our staff enjoys catching up with customers, but because our customers often visit with neighbors and colleagues here as well. This sense of community is a testament to the value we place on relationships, shared stories, and mutual respect and trust. We know that many of our customers are purchasing gifts for significant others when they come to see us. So even though it's what's in the box that counts, we go out of our way to make sure the packaging matches the occasion. When you shop with us, your sales associate will create an elegant, tasteful package – always with a hand-tied bow – that you'll be proud to present to your loved one. Established in 1983 by Mark Oliva 3rd generation entrepreneur. At the age of 14, Mark took an interest in the Diamond andJewelry industry from a family friend even begged his parents to let him go to south Florida by himself to explore suppliers. -They let him and the rest is history. All through Jesuit High School and University of Florida Mark maintained his contacts and continued to sell jewelry - after graduating from college he decided to further his education and attended the Gemological Institute of America. After receiving his GIA Certificate he moved back to Tampa where he contacted one of his suppliers and asked him if he wanted to join him in a new venture that would be called Mavilo Wholesalers - he agreed. They began their company out of the spare office in his fathers and grandfathers business - an old cigar warehouse built in the late 1800s. The first department he created was an IT department understanding that technology would ultimately play an important part in driving the vision of their business model (1987). Initially working exclusively with retail jewelers and wholesalers as a diamond importer, designer, and manufacturer of fine jewelry Mavilo gained a reputation for cutting edge design, integrity and value. Later his brother joins the business, they expanded their manufacturing capabilities and began working with major high end retailers developing further sophisticated design and souring capabilities. Eventually they began dealing directly with customers upon request opening the first original showroom over 26 years ago. Business by referral became so significant that we invested and built a new state-of-the-art diamond and jewelry shopping destination in the heart of South Tampa. Relationships are so important to our business, and we are proud to have worked with generations of families who trust us to deliver the very best diamonds and jewelry to help celebrate the major occasions of their lives. We consider our staff and customers part of our extended family, which is why a visit to Mavilo often feels like a reunion. Our founder, Mark Oliva, and his brother Michael are active, highly participatory owners. If Mark isn't on the floor of the showroom catching up with guests or online with a potential new customer inquiry, inspiring team members with his dedication and passion, consulting on custom design projects or coming up with new ways to delight our customers, he's traveling across the country and the world to strategize, negotiate and discover new sources to bring online or in store. Looking to the future, Mavilo is focused on continuing to innovate and improve upon our core strengths: sourcing, manufacturing, design, technology, customer service & experience, and of course, incredible value. Whether you visit our beautifully appointed showroom and state-of-the-art Service Department or our expanding online location, we think it will be just the first of many enjoyable and educational experiences. We've built the company on the idea that "our best compliment is your referral" and over the years we've received a lot of compliments! Throughout our nearly three-decade history, we have consistently invested in the best talent, resources, and technology, resulting in a flourishing, family-owned business known globally for its best business practices. Our reputation within our community is also stellar, and has been recognized with a variety of local and regional awards over the years. At Mavilo, we go above and beyond what's expected, constantly striving to ensure that every interaction with us is a pleasure, and the first of many.